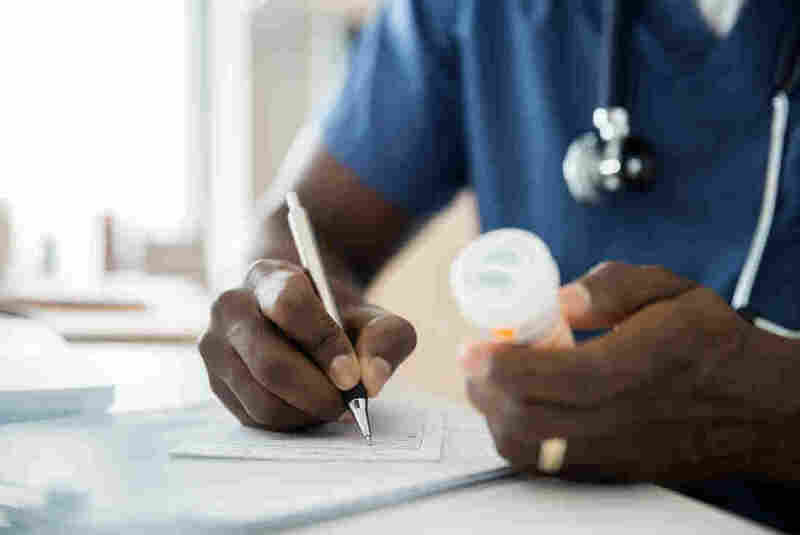 Doctors Encouraged To Use Medications To Treat Alcohol Abuse : Shots - Health News It is still rare for a person struggling with alcohol abuse to be prescribed naltrexone or acamprosate, two medications that have been proven to help. Efforts are underway to change that. Public health officials want doctors to consider treating alcohol abuse with medications that have a track record of success. Two often-overlooked medications might help millions of Americans who abuse alcohol to quit drinking or cut back. Public health officials, building on a push to treat people who abuse opioids with medications, want physicians to consider using medications to treat alcohol addiction. The drugs can be used in addition to or sometimes in place of peer-support programs, they say. "We want people to understand we think AA is wonderful, but there are other options," says George Koob, director of the National Institute of Alcohol Abuse and Alcoholism, a part of the federal National Institutes of Health. It is still rare for a person struggling with alcohol to hear that medication therapy exists. This partly reflects the tradition of treating addiction through 12-step programs. It's also a byproduct of limited promotion by the drugs' manufacturers and confusion among doctors about how to use them. A key study funded by the federal government reported last year that only 20 percent people who abuse alcohol will ever receive any form of treatment, which ranges from seeing a counselor or doctor to entering a specialized treatment program. The same is true for opioid addiction — about 80 percent of people dependent on opioids will never receive treatment. The NIAAA, in an effort to give patients and doctors more choices, has launched programs to develop medications and support drug trials. NIAAA and the Substance Abuse and Mental Health Services Administration also asked a panel of outside experts to report on drug options. "Current evidence shows that medications are underused in the treatment of alcohol-use disorder, including alcohol abuse and dependence," the panel reported last summer. It noted that although public health officials and the American Medical Association say alcohol dependence is a medical problem, there continues to be "considerable resistance" among doctors to this approach. Naltrexone and acamprosate are the two drugs on the market for patients with alcohol cravings. "They're very safe medications," said Koob. "And they've shown efficacy." One of the drugs, naltrexone, is also used to treat opioid abuse. For one North Carolina woman eager to get sober, naltrexone provided that help. Dede, who wishes to remain anonymous, says she went to hundreds of AA meetings. She spent time in two different rehabilitation facilities, one of which cost her $30,000 out of pocket. But she still struggled. "The self-loathing was the worst thing about it," she says. "I hated myself as an alcoholic, but I could not stop." Eight years ago, during a meeting for people who had drinking problems with counselors at the University of North Carolina, Chapel Hill, she first heard about Dr. James Garbutt, a psychiatrist who uses naltrexone to treat patients with alcohol-use disorders. She tried to get an appointment to see him, but was told it would take weeks to fit her in. She wouldn't wait that long. Instead, she showed up in the doctor's waiting room and stayed until he was able to see her. "I begged. I really begged to get to see him," she says. With the help of naltrexone and one-on-one counseling, Dede says she has consumed no more than two sips of wine since that visit. A third drug is also available, but it does not work against alcohol cravings. Disulfiram, also known by the brand name Antabuse, makes people violently ill when they consume alcohol. It has been found to be less effective in helping stem alcohol abuse than the other two drugs. Naltrexone comes in both an oral and injectable form and has few side effects. It was approved for use in alcohol addiction in 1994. Acamprosate was approved in 2004 to treat only alcohol problems. It comes as a tablet. When naltrexone came on the market, many misunderstood how and for whom the drug worked. Naltrexone's makers stopped marketing the drug in 1997. Acamprosate was plagued by many of the same marketing problems. Misunderstanding still persists today. Naltrexone's history of opioid treatment also hurt its image. The drug blocks the effects of opioid receptors in the brain, so opioid users who take it without first having completely detoxed experience agonizing withdrawal. But naltrexone doesn't have the same effect on patients with alcohol-use disorders. A patient who drinks while taking the drug will still experience the effects of alcohol that impair coordination and judgment, but not get the opioid-induced reward to reinforce the behavior. That makes the idea of drinking less appealing. Garbutt, who was on the expert panel last year, encourages complete abstinence for his patients, but also supports patients who would rather set a goal of harm reduction. "If we can reduce your intake 80 percent and reduce your heavy drinking days a lot, that's also very positive," he says. "Some people just aren't ready. The idea of sobriety is just too big of a concept for them to wrap their head around." In fact, explains Garbutt, while naltrexone does help patients remain abstinent, "the effect of reducing heavy drinking is the most prominent effect of naltrexone."